Who Is Responsible for an Injury Suffered on Rideshare Trip? Driving is an integral aspect of American culture, but as people try to reduce the environmental impact caused by car travel and to escape congestion present in cities, ridesharing has become a regular part of life for millions of Americans. However, as more people use these services, the number of car accidents involving rideshare drivers is increasing, prompting the need for injured riders to ask the question: who is responsible? Further, as more and more companies enter the self-driving vehicle area, this question is likely to become more complicated, and an accident involving a self-driving shuttle just hours after its debut only makes this concern more pressing. The Florida legislature passed a new law over the summer that mandates the amount of insurance coverage rideshare companies and their drivers must maintain to operate on Florida roads, but these new rules do not clearly settle the issue of which party is liable in the event of an accident, or how injured passengers will be compensated. A discussion of the new law governing insurance coverage for rideshare companies and drivers, and when liability for an accident-related injury would apply, will follow below. One of the main concerns shared by State legislators and members of the public is ensuring that rideshare companies and their drivers maintain a level of auto insurance liability coverage that reflects the passenger transport function this service provides. To that end, and reflective of the policy limits carried by taxis and limousine drivers, rideshare drivers and/or the rideshare company must have liability coverage of $50,000 for death and bodily injury per person and $100,000 for death and bodily injury per incident when the driver is logged onto the system but is waiting for a ride request. When the driver is engaged to pick up a passenger, the liability policy limits must be $1 million for bodily injury and death. However, uncertainty remains about the applicability of the driver’s Personal Injury Protection (PIP) coverage because the new law permits a driver’s personal auto insurance company to deny benefits for an accident claim if the collision occurred while the driver was logged into the rideshare company’s app or engaged in passenger pickup/drop-off. 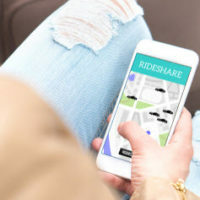 This provision leaves injured passengers with less opportunity for recovery, since it is likely that the rideshare companies will try to disclaim liability as much as they can. Determining who may be liable for an injury and required to compensate an injured party for medical bills, lost wages and, in some circumstances, pain and suffering is based on who caused the accident. A rideshare passenger, absent an unusual circumstance where he/she interferes with the driver’s ability to operate the vehicle, would not be responsible, and thus, would not be liable if the rideshare driver or an individual in another vehicle was injured. Further, rideshare drivers are not always responsible for accidents, and in this case, the first party to seek compensation from is the driver in the other vehicle that caused the accident, usually limited to the driver’s PIP’s coverage, which maxes out at $10,000. However, the passenger should still be able to make a claim against the rideshare company’s $1 million accident liability policy, and this coverage would certainly apply if the rideshare driver caused the collision. However, car accident injury cases often involve a number of potential defendants, and can become quite complicated if insurance companies try to deny the applicability of coverage. An experienced car accident personal injury lawyer is best positioned to understand this issue and how to effectively respond. Getting into a car should not end with an injury, and if you were the unfortunate victim of a car accident, you need the assistance of an experienced personal injury attorney to get the recovery you deserve. The Miami law firm of Pita Weber Del Prado has years of experience handling personal injury claims for car accident injuries, and is available to evaluate the facts of your case. Contact the office for a free consultation.